If you don't already have an APEX 5 workspace you can use for this tutorial, or if you'd rather use a new one just for testing, head to http://apex.oracle.com to request a free workspace. Let's get started! Click Create (for a new application). Click Install Application. If the app is already installed you can select Manage > Remove first. Click the Sample Database Application from the list of applications. Click Run Application. This will open a new window to run the app, continue in that window. Click Products in the menu on the left. You should see the page below. We'll be modifying this report, making the Available column editable. Click the Edit Page 3 link in the Developer Toolbar (anchored to bottom of the browser window). This will return you to the original window where you can work on the application. Click Products in the component panel on the left. This will "select" the Products region and display its properties in the properties panel on the right. 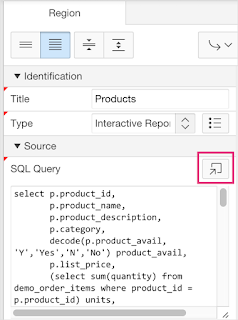 Click the button to open the SQL Query in the code editor. Update the SQL Query with the code below. This will add a new column that we'll be using to change the status of Available. The 4th parameter is adding some attributes to the elements that we'll use later on. Click OK. This will save your changes in the code editor to the SQL Query in the properties panel. Look back to the left panel and click Columns under Products to show the columns for the region. 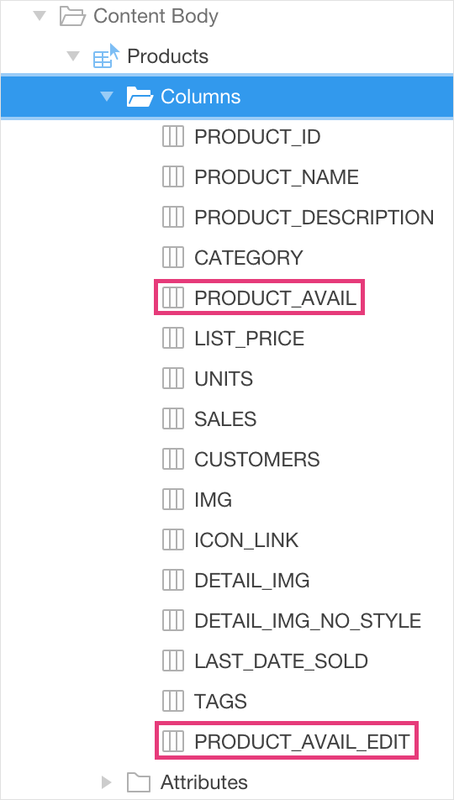 You should see both the previous PRODUCT_AVAIL column and the new PRODUCT_AVIAL_EDIT column at the bottom of the list. Scroll down the properties in the properties panel on the right until you get to the Condition section. Set Type to Request = value. 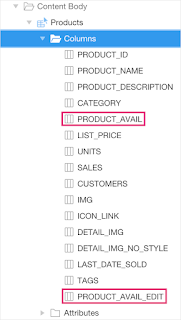 Return to the component panel on the left and click the PRODUCT_AVIAL_EDIT column. Scroll to the top of the properties panel on the right and set Heading to Available. Set Column Alignment (under Layout) to center. In the Enable Users To section, set everything to No. Under the Condition section, set Type to Request != Value. Under Security, set Escape Special Characters to No. Click the play/run button in the upper right-hand corner of the page to save your changes and run the page. Your page should now see the editable column as shown below. Click the Buttons button in the component menu at the bottom/center of the screen. 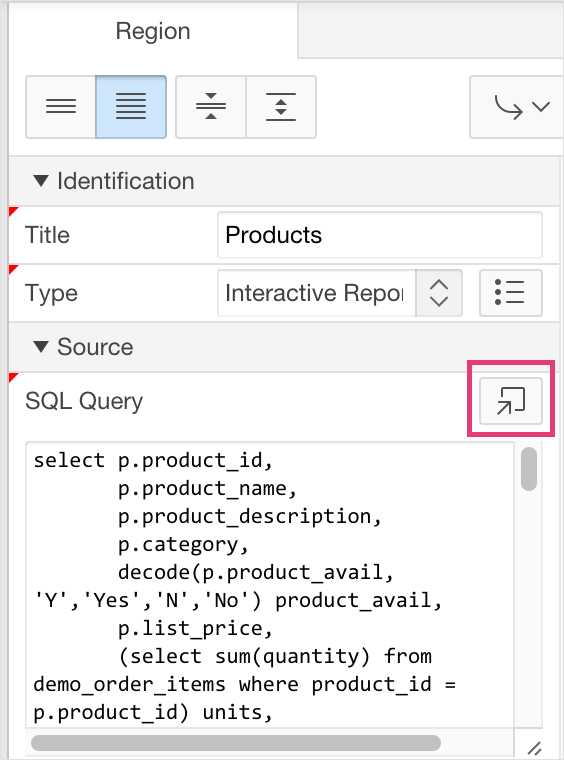 Drag a Text button into the RIGHT OF INTERACTIVE REPORT SEARCH BAR display position of the Products region. In the properties panel on the right, set Button Name to SAVE. Return to the component panel on the left, right-click the new SAVE button, and select Create Dynamic Action from the context menu. In the properties panel on the right, set Name to Save Clicked. Return to the left panel and click the true action Show which is currently red. Under Affected Elements, set Selection Type to - Select - (essentially disabling it). 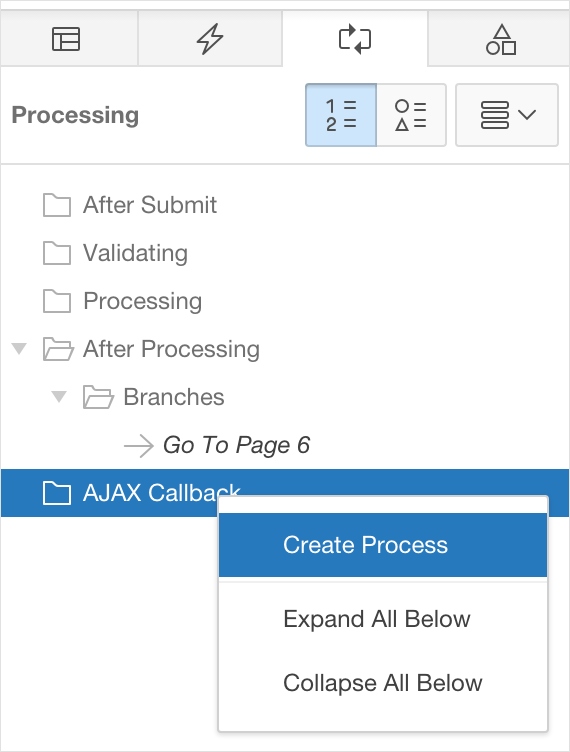 Under Execute Options, set Fire On Page Load to No. In the upper right-hand corner of the page, click Save to save your changes. You could run the page at this point to see how the button looks, but it will not work until we finish the next part. 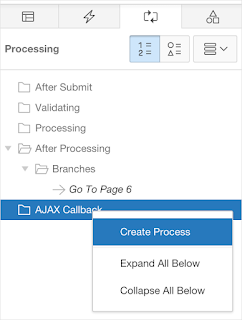 Right-click AJAX Callback under the processing tab of the left panel and click Create Process. In the properties panel on the right, set Name to UPDATE_PRODUCTS. Set PL/SQL Code to the following code. That's it - you should now be able to run the page, make changes to the Available column, and save those changes to the database!